The brand-new 2019 Mazda3 is an incredibly good car, available in both sedan and hatchback body styles. Although Mazda has always offered a manual transmission on its compact model, the only way to get a stick on this new version is to select the . The base trims, all-wheel-drive models, and the sedan are only available with a six-speed automatic, making the manual a rather pricey option. We but its excellent chassis and upmarket interior had us pining for the. 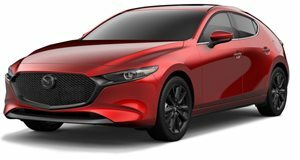 Since Mazda has no intentions of offering a sportier Speed3 and many enthusiasts aren't willing to spend over $27,000 on a car with just 186 horsepower, we have come up with six cheaper alternatives. Instead of waiting for a new Speed3, why not just get an old one? The original MazdaSpeed3 has now become incredibly cheap, with first generation models now available for around $5,000. Even a low mileage second-generation model will only cost you around $16,000. Both generations are powered by a 2.3-liter turbocharged four-cylinder engine sending 263 hp to the front wheels through a six-speed manual. Torque steer is all part of the fun. The third generation Subaru Impreza WRX (sometimes referred to by enthusiasts as the Stink Eye) was built from 2008 to 2014 in the hatchback bodystyle before ditching the Impreza name and becoming a sedan only. Power came from a 2.5-liter turbocharged flat-four producing 227 hp, which was later increased to 265 hp. There was also a more potent STI version producing around 300 hp. High mileage WRX examples can be found for around $10,000 while lower mileage STI cars get up into the mid-$20,000 range. Ford finally gave the US a taste of the Focus ST for just six model years before discontinuing the car completely. The Focus ST uses a 2.0-liter turbocharged four-cylinder engine producing 252 hp with power going out to the front wheels through a manual transmission only. Used examples range from under $10,000 to around $25,000. The eighth-generation Volkswagen Golf is in the works, meaning a new GTI is on its way. Seventh-generation models have now become pretty affordable with prices ranging from around $12,000 to around $30,000 for practically new examples. The GTI's 2.0-liter turbocharged four-cylinder produces 210 hp or 220 hp with the optional performance package. Transmissions choices include a six-speed manual or DSG, both of which are fantastic. Although only a tad more powerful than the new Mazda3 with a 2.0-liter turbocharged four-cylinder producing 189 hp, the Mini Cooper Clubman S offers something the Mazda does not - a manual transmission and all-wheel-drive. The only way to get a Mazda3 with four driven wheels is to opt for an automatic, whereas the Mini can be had with any drivetrain combination. You can score a current generation Clubman S for less than $25,000 or find the previous generation John Cooper Works version with a 1.6-liter 208-hp engine for around $10,000. The Kia Forte isn't often mentioned in the hot hatchback conversation but for the 2016 and 2017 models it was sold in the SX trim with a 1.6-liter turbocharged four-cylinder producing 201 hp. Power went out through either a six-speed manual or seven-speed dual-clutch, making this often forgotten hatchback worth a look. You can find a Forte SX starting at around $15,000.